Flashlights seem to be the hottest new accessory these days. Just take a look at how these devices are being made. From super-bright lights to strobe effects, USB chargers, etc., today’s flashlights are more advanced than the old mag lights are dads used to feed D batteries into decades ago. Today, there are Facebook groups dedicated to discussing and comparing flashlights. It’s cool if you’re all about that life, but Solid Signal urges you to be careful. Some online electronics retailers hype what these flashlights can do in order to make the sale. Solid Signal explains the truth about flashlight abilities so you can make better buying decisions. Lumen ratings is one of the most misunderstood and abused aspects of flashlight marketing. A Lumen rating measures the amount of visible light a flashlight delivers, aka its brightness. 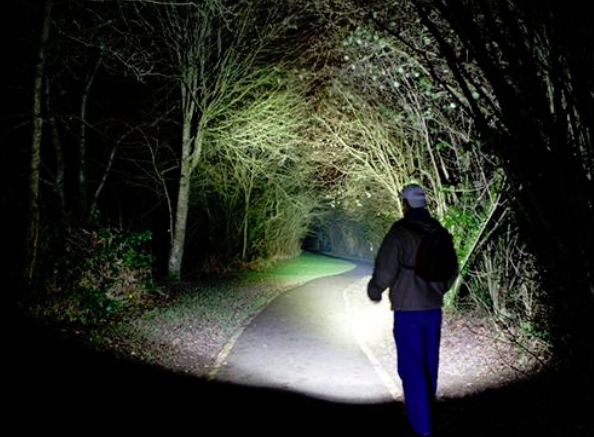 Ultra-bright LED lights is one of the biggest trends in flashlights right now. Unfortunately, this love for high Lumen ratings is how some unscrupulous electronics retailers take flashlight fans for fools. In some cases, they’ll have you believe that the pocket-sized flashlight they sell can light up the night with earth scorching luminosity. I’ll use a fictional example to illustrate my point. Let’s say the “Acme Super Spot 2000” advertises a 2,000 Lumen light. Wow! Two thousand Lumens sounds like the kind of ultra-bright flashlight a flashlight fan would dream of owning. There’s only one problem: the Super Spot uses just one T6 Cree LED light. While the T6 Cree is very bright, it’s not 2,000 Lumens bright. It’s capable of generating a maximum 1,000 Lumens of light. The company marketing it as a “2,000 Lumen flashlight” is deliberately misleading. In order for the Acme Super Spotlight to have 2,000 Lumens, it would need to have two Cree LED lights. There are high-powered flashlights that have multiple T6 Cree LED lights, but the “Acme Super Spot 2,000” isn’t one of them. Flashlight fans looking for the brightest of the bright need to read the key features and spec sheets on these flashlights before buying them. We always recommend comparing how different electronics retailers advertise the same flashlight to see which one is honest, and which is hype. So-called tactical flashlights are notorious for this kind of advertising. So, do you know how flashlight makers determine their products’ impact resistance? The flashlights are tested by dropping them a total of six times onto concrete at specific distances rated in meters. The goal is to see if the light remains functional after these occasional drops. It’s not a test of a flashlight’s resistance to being run over by a truck, hit with baseball bat, or used as a hammer. Not by a long shot! A couple things about impact resistance ratings. The first being that I’m not sure whether this is a standardized test conducted by an impartial agency, or something that’s done in-house at each flashlight manufacturer. Secondly, even if these tests are done by a third party, these are done in very controlled conditions. I’m not entirely convinced that so-called impact resistance tests mimic the same real-world conditions that have ruined a few of my flashlights. When I’ve dropped flashlights, they’ve fallen farther than a few meters. On its way down, it crashed into and bounced off tools or and heavy equipment in my garage. Once it hit the floor, it skittered across the concrete and slammed into my workbench before coming to a rest. Its “heavy-duty, forged aircraft aluminum” body remained intact, but it wasn’t enough to protect the flashlight’s delicate internal workings from all that abuse. The flashlight was a total loss. Bottom line: no matter how tough your tactical (aka tacti-cool) flashlight is, it’s NOT a high-impact device. Water resistant is a term that gets thrown around the flashlight world. When the average person hears it, they might think it means their flashlight is “waterproof.” (I know that I fell for that back in the day.) To truly understand how water resistant ratings work, consumers need to learn the IPX rating system. The “IP” stands for “ingress protection,” which really means how well the device is protected against water or dust getting into its casings. Beam Types: Know whether you need a flood (fixed), spot (focused), or adjustable beam on your flashlight. Rechargeable: Certain lithium-ion batteries can be recharged through a USB connection or other recharging options. This is usually your best option, especially if you’re a fan of high-Lumen flashlights. Beam Distance: Measured in meters, this tells you how far the light will shine before its brightness is diminished to the equivalent of the light from a full moon. Bulb Type: Nothing beats the energy efficiency, run time, and brightness of today’s LED technology. Keep that in mind when flashlight shopping. When it comes to marketing flashlights, Solid Signal doesn’t use unrealistic hype to market the products we carry. We have a product specialist who is an avid flashlight collector himself, and he puts a lot of time and effort into choosing the ones that best represent our customers’ needs. This person also takes an active role in crafting the product descriptions and daily deals that feature these flashlights. This means we’ll give you a correct Lumen rating and other key features that you can trust. Tech Choice G700 1000-Lumen CREE LED rechargeable aluminum flashlight: This is one of our most popular flashlights and food good reason. It features an ultra-bright, 1,000-Lumen Cree XML T6 LED light. (You can trust that Lumen rating!) It also comes with a rechargeable lithium-ion battery and recharging kit, as well as many other useful features. I personally own this flashlight, so I can attest to its usefulness. It’s helped me clean out drains, provided light during a blackout, and it’s strobe effect came in handy for our outdoor Halloween decorations. I highly recommend it as a great, multi-purpose flashlight to have around your home. Tech Choice M6 2,000 lumen CREE XHP50 LED rechargeable flashlight: If you really want that 2,000-Lumen flashlight, this is it. While the M6 is definitely bright, that’s not is most helpful function. This flashlight features a zoomable convex lens that you can adjust for wide coverage lighting or a spot beam. What makes the spot beam feature so helpful is that the light around the edges doesn’t blur or fade. This tight circle of focused light is a huge help if you’re working underneath your truck and need to shine some light on the area you’re trying to repair. Again, this is a great, all-purpose flashlight for any family to have around the house. Whether it’s just something you want to have around the house or a flashlight for a more specialized use, Solid Signal has it. We carry a wide variety of flashlights in our well-stocked online inventory. You’re always welcome to look around for the one you need. If you have any questions about a particular flashlight, or would like a product recommendation, give us a call at 877-312-4547. Solid Signal’s product experts are always happy to help!